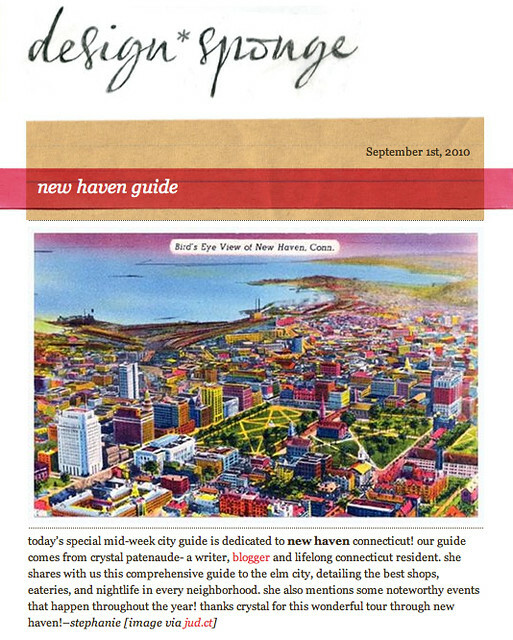 Yesterday I was very happy to discover that the fabulous blog design*sponge has now written a city guide to New Haven. Having avidly read their guides to other major tourist destinations--London, Paris, New York, Boston etc.--I was super pleased to see them doing a feature on my hometown! As a lifelong resident of New Haven--which often gets a unduly bad wrap--it was quite exciting to read a thoughtful re-presentation of the city, pointing out all my favorite places to eat, shop, explore and enjoy. You can read design*sponge's New Haven city guide here and find more of their city guides here.